As well as overeating, I think we can all agree Christmas time is a time for wine. 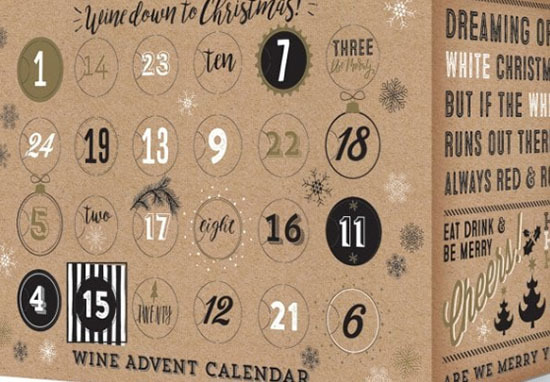 Luckily, an advent calendar for wine lovers is making sure we’ll be able to open up a bottle every day in December. Admittedly, drinking a whole bottle of wine every day for a month is probably a bit excessive, even at Christmas. But thankfully, the bottles that come with the calendar are a more manageable, mini size. Sold online by Amazon, the adults-only calendar comes packed with 24 quarter bottles (187ml), with a variation of white, red, and rose to cater to all your wine loving needs. There’s even bottles of mulled wine included, to really get you feeling merry. Though, the regular bottles of wine would probably get you feeling that way anyway! I wouldn’t recommend opening up the calendar in the morning, as you might a chocolate-filled one. It might be quite hard to explain why you smell like alcohol in the morning at work. Some examples of the bottles in your mini wine collection include South African Merlot, Australian Chardonnay, Chilean Sauvignon Blanc and a White Zinfandel from the USA. The calendar would make the perfect gift for any wine lover, and even opens up the opportunity for an add-on present in the shape of a wine glass. The calendar is created by First 4 Hampers and is on sale for £69.99 – making it less than £3 per bottle. I think it’s a small price to pay for a boozy celebration every day of December. 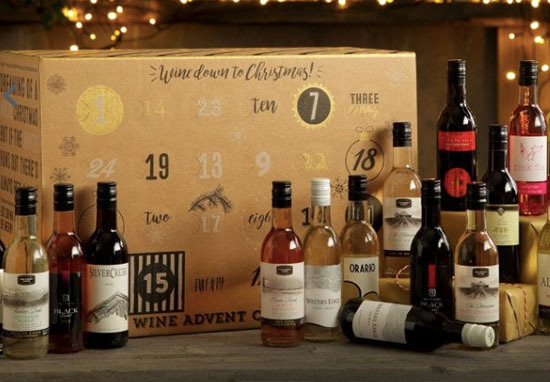 If you want an alcohol advent calendar but wine isn’t the drink for you, then First 4 Hampers has you covered. They also stock a beer calendar, a gin and tonic, and a fizz calendar. I think we’re all going to be in for a very happy Christmas if we get our hands on one of those! The fun doesn’t have to stop with the last door of the calendar, either, because the company have created a gin flavoured cracker. While the paper hats and corny jokes are classic Christmas, I think a gin-filled cracker would be much more entertaining.